Spacious apartment in great location Close to beach, restaurants and directly opposite Pacific Fair shopping centre. Apartment was spacious and had great views (ocean view room). Carpet was in need of replacement but otherwise a very comfortable stay. Big downside was having to pay for WiFi !! Beautiful views. Awesome 4 night stay at the lovely resort. The location is so close to the beach, cafes, restaurants and night life of Broad Beach. We will definitely be back to stay again. It's time to ring the boss and put in your leave. New adventures await! You'll find some insanely good-looking deals on accommodation in Broadbeach, 1 kilometre from central Gold Coast. Start making epic memories (and snapping some brag-worthy selfies) at Sea World, Dreamworld and Warner Bros. Movie World, just some of Gold Coast's famous sights. 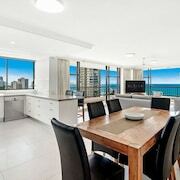 Surfers Paradise Beach and the Star Gold Coast are in the area surrounding Broadbeach. These popular attractions ought to be on your travel list. You don't have to spend ages getting from your hotel to experience Surfers Paradise Beach. Wake up nearby at the Peppers Soul Surfers Paradise, Peppers Broadbeach, Hilton Surfers Paradise Residences, ULTIQA Air On Broadbeach and Aria Apartments and have extra time for the fun stuff. You'll have a delightful time dipping your toes in the cool water, and meandering along the shores of Kurrawa Beach. 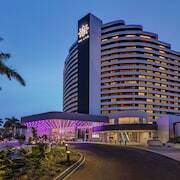 The Hilton Surfers Paradise and BreakFree Diamond Beach are some of the most fabulous places to stay a night or two close by. Have a hit at Putt Putt Golf Mermaid Beach, where you are certain to develop some wicked putt putt skills! 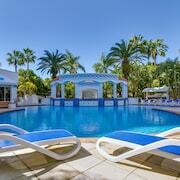 Some accommodation options to look into around here are the Miami Beachside Holiday Apartments and Mantra Sierra Grand. 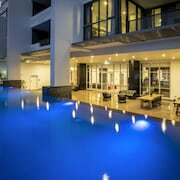 Want to stay in Broadbeach but don't want to burn a hole in your wallet? 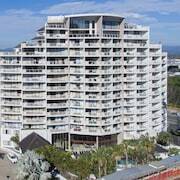 Have a look at the legendary rates at the Meriton Suites Broadbeach, Gold Coast. You better book in quickly though, as there are only a few cheap lodging spots here. You definitely don't need fluffy bathrobes, a delectable room service menu and 1000 thread count sheets all the time (that said, it's nice to splash out every now and then, right?). 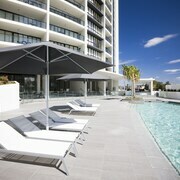 The deluxe options here include the Star Grand at The Star Gold Coast and Bel Air on Broadbeach. Away with your buddies but need a bit of downtime? Fancy just chilling with the latest novel and a hot coffee? Then why not find a quiet corner in Brew Brew Bubble Tea Broadbeach? Trust us, you're gonna need some decent food after all that sightseeing. Luckily, Broadbeach Restaurant Area has a mouthwatering menu which will really fill you up! Now you've warmed up, we're guessing you wouldn't say no to a few bevvies at SENSATION - Food & Wine Lounge. It's an excellent place to debrief after a day of adventures. Don't panic if you can't find the ideal Broadbeach hotel room. You'll discover other cool places to stay nearby. 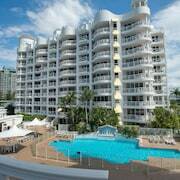 Broadbeach Waters is 2 kilometres from Broadbeach, and Mermaid Beach is 2 kilometres away. From flights to hotel rooms and rental cars to experiences, we'll make it a piece of cake! All you've gotta do is turn up and start sharing your #IntrepidTraveller moments.